Download Ruby version 2.3.x (32 bit) or on http://rubyinstaller.org/downloads/. Copy the code written below and paste it in the CMD (right click, paste). While it's installing do not copy something else. Type ansicon.exe -i and ansicon will be installed. Ansicon does not give a notification about the installation completed. This section is for you to have a better understanding of what is happening during the installation. And what the commands we're using in CMD actually mean. 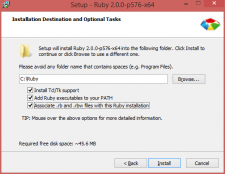 When we installed ruby, we checked a checkbox saying "Add ruby executables to your PATH". What we did here, was making ruby commands globally accessible in the CMD. Now because these commands are global, we can go to devkit folder and write "ruby dk.rb install". Where we are actually saying: "Hey Ruby! I want you to look at this file dk.rb I have here and install it". Same thing happens with "gem install lapis_lazuli": "Hey Ruby, I want you to do something with a gem, which is installing and the name is lapis_lazuli". After which Ruby is going to look online in their software system looking for a gem called lapis_lazuli. gem install lapis_lazuli --no-document Test automation gem that will enforce best practices, forcing the TA engineer to produce better code. gem install cucumber --no-document The software that will run the scripts from console. Unable to find chromedriver. Please download the server from http://chromedriver.storage.googleapis.com/index.html and place it somewhere on your PATH. More info at https://github. To make sure you can use this project in your preferred browser look for example on the internet for "<browser name> driver selenium"